Perhaps you know the feeling: that moment when you see with your eyes something you have previously only seen in pictures. Before today, I knew the Larsen C ice shelf only from the satellite images we have published since August 2016. The attention paid to the shelf off the Antarctic Peninsula has been due to a rift that eventually calved an enormous iceberg. Today (November 12), the Operation IceBridge mission flew its suite of airborne instruments over the shelf and I caught a first-hand look. 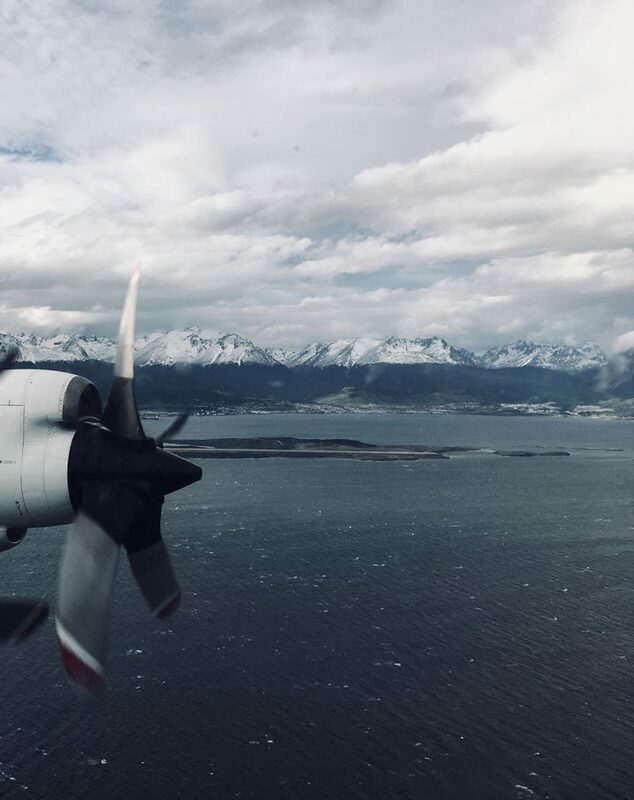 The view from the P-3 after take off shows mountains that received an overnight dusting of snow in Ushuaia, Argentina. Photo by Aaron Wells. I was aware that I would be seeing an iceberg the size of Delaware, but I wasn’t prepared for how that would look from the air. 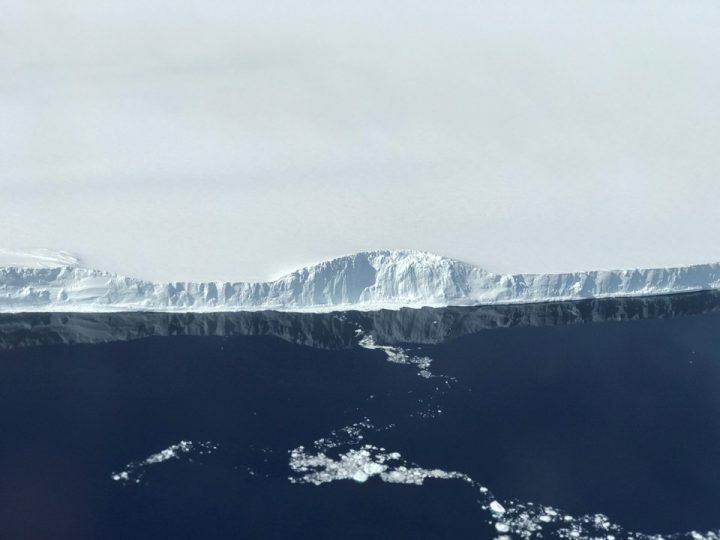 Most icebergs I have seen appear relatively small and blocky, and the entire part of the berg that rises above the ocean surface is visible at once. Not this berg. A-68 is so expansive it appears if it were still part of the ice shelf. But if you look far into the distance you can see a thin line of water between the iceberg and where the new front of the shelf begins. A small part of the flight today took us down the front of iceberg A-68, its towering edge reflecting in the dark Weddell Sea. The edge of A-68, the iceberg the calved from the Larsen C ice shelf. Photo by NASA/Nathan Kurtz. This particular flight, however, aimed to get more than just a surficial look at Larsen C; to understand the system as a whole, scientists also want to know the bathymetry of the bedrock below. To do that, the flight path was planned with gravity measurements in mind. While radar instruments can “see” through snow and ice on land to map the bedrock, radar has trouble when instead of land there is water below the ice. For the gravimeter, that’s not a problem. The new flight lines—flown for the first time—followed the ground tracks of the future ICESat-2 satellite, and simultaneously increased the area of Larsen C mapped with the gravimeter. 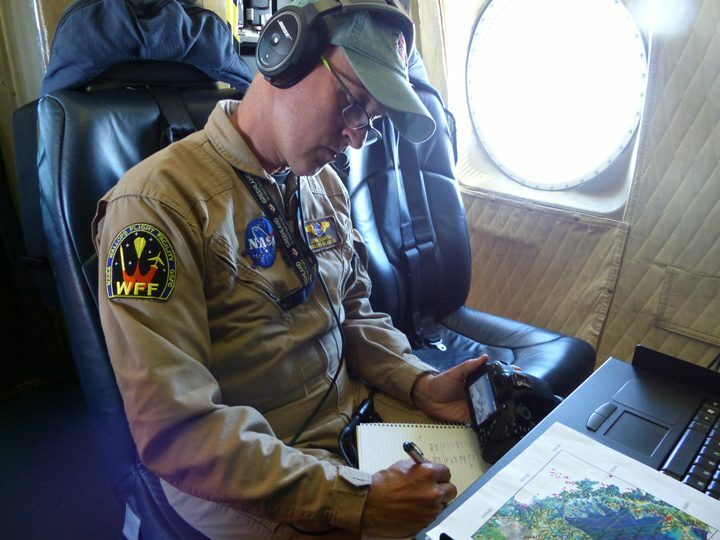 John Sonntag, Operation IceBridge mission scientist, takes notes during the science flight over Larsen C. The planned flight lines are in the foreground. Nathan Kurtz (IceBridge project scientist) and Sebastián Marinsek (Instituto Antártica Argentino) observe Larsen C from a window on the P-3. This entry was posted on Monday, November 13th, 2017 at 11:18 am and is filed under Operation IceBridge, Operation IceBridge: Antarctic 2017. You can follow any responses to this entry through the RSS 2.0 feed. Both comments and pings are currently closed. Keep up the good work! We are changing the climate and you are gathering the critical data. Once it moves out to sea, how long before it will melt? Will it be capable of causing the sea to rise and shoreline damage? And where might it’s direction go? On behalf of the rest of us, thank you for all your research and findings! Since you know the gravity and you know the weight of ice, artist’s rendering of the unseen (underwater) mass would be interesting just for the scale. I AM IN AW OF THIS. MY FIRST TIME EVEN READING ABOUT (WHAT I UDE TO THINK…A TRIVIAL ICEBURG. IT MOVES ME ONTO BELIEVING/INTERESTED IN CLIMATE CHANGE. WILL BE TRACKING IT AND READING ABOUT OTHERS.The TRILLION TONS KNOCKS ME OUT TRYING TO IMAGINE IT. THANKS FOR YOUR GREAT WORK & THE AMAZING INFO.